Stung by a negative review of the Model 3 by Consumer Reports, Tesla CEO Elon Musk is promising to fix problems cited by the magazine. And he says he'll be able to fix cars already on the road without them being brought in for service. Consumer Reports has generally been a fan of previous versions of Tesla, giving one version of the Model S, the luxury sedan, a better than perfect score. But it said Monday it couldn't recommend the Model 3, which has a much lower starting price of about $35,000, because of problems like braking and handling. In a series of tweets, Musk says that the Model 3 that Consumer Reports used in its review is an early version of the car that started production last summer. He said since that time, Tesla has made improvements that will give it better braking and handling. "Consumer Reports has an early production car. Model 3 now has improved ride comfort, lower wind noise & many other small improvements. Will request that they test current production," he tweeted late Monday night. Also, Consumer Reports has an early production car. 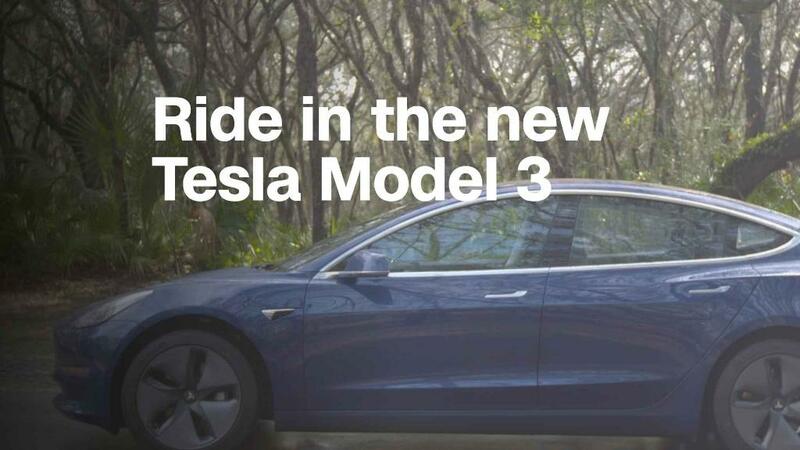 Model 3 now has improved ride comfort, lower wind noise & many other small improvements. Will request that they test current production. Musk said the firmware update for braking can be accomplished through an over-the-air download that should role out within a few days. "With further refinement, we can improve braking distance beyond initial specs. Tesla won't stop until Model 3 has better braking than any remotely comparable car," he said in one tweet. Looks like this can be fixed with a firmware update. Will be rolling that out in a few days. With further refinement, we can improve braking distance beyond initial specs. Tesla won't stop until Model 3 has better braking than any remotely comparable car. "To be clear, all Model 3 cars, including early production will have same great braking ability," he said in another tweet. "Nature of any product, however, is that if you care about perfection, you make constant small refinements. Today's Model S is far more refined than initial production." To be clear, all Model 3 cars, incl early production will have same great braking ability. Nature of any product, however, is that if you care about perfection, you make constant small refinements. Today's Model S is far more refined than initial production. Musk is someone who doesn't take well to criticism from the media or other people. During a recent conference call with analysts he refused to answer some questions about Model 3 production, saying that "boring, bonehead questions are not cool." and "these questions are so dry. They're killing me." He has also frequently taken shots at negative news stories. Consumer Reports issued a statement saying it would be happy to retest its car once it has been updated. "CR is pleased that Tesla is taking our braking test results seriously," said Jake Fisher, Consumer Reports, director of automotive testing. "That they are committed to implementing a fix and improving stopping distances on the Model 3 is good for everyone on the road. Our goal as a non-profit membership organization is to create a fairer, safer world with and for consumers. That means better and safer products for all. If Tesla can update the brakes over the air -- an industry first -- we'd be happy to retest our Model 3."